1) Ultimately, enabling access for disabled people is all about good manners and common sense. It’s about respecting people: remembering that everyone has different needs and is just as entitled to have these met as you have yours; remembering that everyone has as much right as you do to live their lives to the full; and accepting your role and responsibility in enabling this. But it is also about remembering that your own needs will change in the future, and working to change the world so that it will be more responsive when this happens. And, of course, it is about good business sense: disabled people are even more likely than others to travel with companions, friends or family, so losing their business will have a serious effect on profits. 2) Knowledge is power and attitude is everything, so training is essential – and for all staff, not just a few. Disability Equality Training should fit seamlessly into customer service training as a whole, and service levels for older and disabled guests should at least match the level of service being offered to other guests rather than being inferior. 3) Guests need information too, so make sure that your website and other marketing and booking materials contain as much information as possible about the facilities that you provide. In particular, include details about parking (and the route to the parking spaces if this is not clear), bathrooms, bed types, lifts and room and doorway sizes. Make sure that everyone who provides information by telephone to guests and potential guests also has rapid and easy access to these details and knows where to find them. 4) There is no such thing as an ‘average’ disabled or older guest. Everyone will have different needs, so flexibility is essential and a range of provision is necessary. If you have more than one accessible room, for example, offer a choice of wet room, shower and bath in the different rooms. Vary the height of toilets and beds and offer different mattress types too (as well as a choice of twin or double beds), rather than making all the rooms identical. And always choose beds for accessible rooms where an adequate gap is left between the bed base and the floor to enable a hoist to be used. 5) Make sure that you have Blue Badge parking available, and enforce this vigorously as it will be essential for disabled guests to be able to access the hotel. Parking provision should be as close to the hotel entrance as practical, and should also be varied wherever possible. Some wheelchair users will need space behind their vehicle in order to unload; others will need a wide enough parking space to unload at the side. And increasingly wheelchair users’ vehicles tend to be higher than other cars, so ensure that you have some spaces available with more than 2.5m head-room if your parking area has height restrictions. 6) Remember, too, that disabled and older guests’ circumstances will be as varied as other guests. Some will need accommodation for their whole family, some will be on their own, some will have assistants or companions with them, some will be traveling on business and some will be traveling for leisure. If you have family rooms, ensure that at least one of them is accessible, and provide adjoining rooms next to other accessible rooms for assistants and companions. And ensure that your room allocation system is robust: there is no point in having an adjoining room available if it is allocated to an unrelated guest, while a disabled person’s assistant is given a room two floors away. 7) Many disabled and older people will not book a wheelchair accessible room, and indeed will not think of themselves as being disabled, but will still have mobility needs. Just as you offer guests a choice of pillow types, extra blankets etc, offer bath mats, shower stools, toilet seat raisers, mattress toppers and so on as standard options that can be ordered from housekeeping. Ideally have at least one hoist available too – guests traveling by car may bring their own, but this will be impractical for the remainder. 8) Think disability access when choosing all fittings, not just those for accessible rooms. For example, fitting grab rails and non-slip surfaces in all toilets and showers will reduce accident claims from guests who have been drinking, as well as making it easier for disabled and older people to manage in your standard rooms. 9) Accessible should not mean medical: disabled people don’t want to stay in hospital rooms (and indeed the newer hospitals aim to mimic hotels anyway). Expect your architects, builders and designers to provide aesthetically pleasing solutions, and don’t assume that this will automatically be more expensive than you would normally expect to pay. And ensure they understand that you are aiming for the highest possible standard, rather than the least they think you can get away with if you are taken to court. 10) Size matters, particularly when it comes to room size. Wheelchair users will need enough space to circulate around their rooms, while wheelchairs and scooters can vary dramatically in size. People with a wide range of other impairments will also struggle to cope when rooms are too small/over-crowded and non-disabled guests prefer larger rooms too, so think big not small when building or updating. 11) Remember that disabled and older people will have a wide range of access needs; it is not enough simply to cater for mobility needs. Visually impaired guests will find it easier to see if you use contrasting colours in bathrooms etc, make sure that signage is large enough, and provide information materials in at least a 12-point ‘sans serif’ font. Guests with hearing impairments will benefit if alarms etc include flashing lights and announcements are made on electronic signboards as well as over public address systems. And in conference and meeting areas, make sure that lighting levels are high enough for people to lip-read, and always provide microphones and amplification. 12) Some disabled people travel with dogs — not just Guide dogs, but hearing dogs, general assistance dogs and dogs performing a range of other tasks too. Refer to these dogs generically as assistance dogs, and ensure that your signage does not refer simply to ‘Guide dogs’ in case it puts other dog users off staying with you. Make sure that you have suitable provision for disabled people to exercise their dogs safely outside, and provide a separate bin for related waste. Train staff not to ask questions about the tasks dogs carry out, as this is personal information that would not be asked of other guests, and make sure that they know not to pet the dogs as this can hinder dogs’ ability to work. 13) The more independent that you can make your guests, the less your staff will need to do to help them. For example, the level of service that you offer has to be adjusted by law to enable disabled people to access it, so even if you don’t normally offer a porter service, you will need to assist disabled people with their luggage if required. But the provision of luggage trolleys will make assistance less necessary than otherwise, and will also aid your staff to assist guests more quickly when needed. 14) Similarly, providing a complimentary companion’s room for a disabled guest — preferably connecting as well as adjoining — will reduce the need for hotel staff to provide assistance. Many disabled people will not be able to afford to pay for accommodation on top of the other costs of bringing an assistant, so will otherwise travel alone. Personal assistants will not normally be prepared to share a room with a disabled person unless this is necessary for medical reasons, and volunteer companions will normally prefer privacy too – as, of course, will disabled people themselves — so don’t assume that providing two beds in a room is an adequate alternative. 15) Think about the rest of the hotel layout, not just the rooms themselves. Heavy doors pose a particular problem for a wide range of older and disabled people, and in many cases the force required to open them in practice is greater than the legal maximum. Ensure that door closers are correctly set and maintained to make them as easy to open as possible, and install automatic doors wherever possible. 16) Remember that the facilities you provide will be worthless if they are not functioning correctly. Check at least daily to ensure that hearing aid loops, emergency alarms, electric hoists, automatic windows etc are working properly: don’t wait until someone needs to use them or you have an access audit to discover that they are broken or need recharging. And don’t forget that heating is particularly important to disabled and older guests: make sure the heating system in individual rooms is correctly maintained and checked regularly, and that there is a way of adjusting heating to meet individual needs. 17) Also ensure that housekeeping staff understand how to maintain the layout of accessible rooms, toilets and other facilities. For example, maids commonly block wheelchair transfer spaces in toilets with bins, pull back alarm cords from where they can easily be reached when someone has fallen, and leave windows open after cleaning to leave rooms unacceptably cold. It is not enough for facilities to be theoretically accessible; they have to be accessible in practice. It is extremely desirable to have regular access audits, but the people who are critical to making your hotels are accessible are your own staff. 18) Remember that language matters too and can cause offence however good your service is otherwise. Talk about personal assistants and companions rather carers unless your guest chooses to use the term first; similarly talk about disabled people, not handicapped people. Speak to your guest, not about them, and be careful how you refer to wheelchair users – they are not confined or bound to their chairs. And ask about access needs not disabilities or impairments – disabled and older people should not have to disclose any more personal information to you than other guests do. Overall, though, acceptable terminology varies worldwide, so let your guests dictate your language, not your staff. 19) Use feedback to improve your service still further, and don’t be defensive about it: if you have failed to get it right, apologise. Make sure that you ask the right questions on feedback forms, rather than forgetting to ask specifically about access. 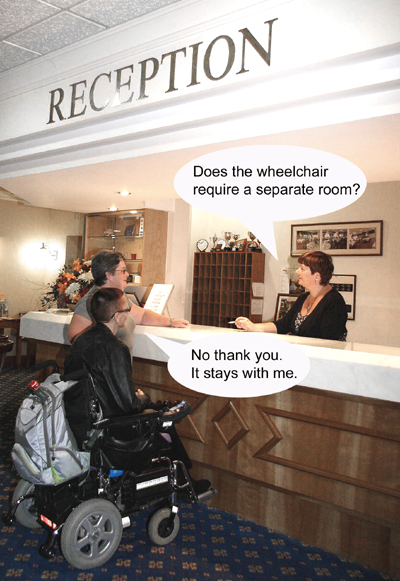 20) Finally, remember that disabled and older guests wish to have the same experience of your hotel as everyone else. They do not want to have to use complicated, ‘special’ booking systems rather than the standard one; nor do they want to have to explain the personal reasons behind their access needs to the hotel staff rather than simply having those needs met; nor do they wish to begin — or end — their stay with a complaint rather than their needs being met as a matter of course; nor do they want to leave wishing that they had booked a different hotel or had stayed at home instead. If they are having to do any of these things, then you still have a way to go to improve your service. © Ju Gosling aka ju90 2009. Photo: Lesley Simpson. NB: This text can be copied and used freely so long as it is both unamended and credited.